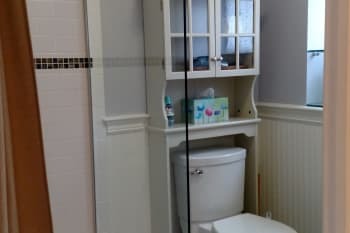 Come and experience a very private, enjoyable stay in one of the unique apartments at the Rondout Inn. Owners, Larry and BC are more than happy to share their knowledge of the local area's restaurants, shops, and happenings. The Rondout Inn is a fully renovated, circa 1820 3-story Federal style townhouse located just 2 blocks from the bustling Kingston waterfront. Relax and unwind in the luxury of a spacious apartment suite instead of being confined to a single room. 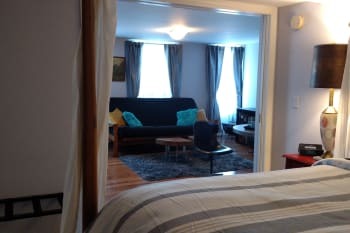 All apartments are uniquely and lovingly decorated and furnished in an eclectic mix of antiques, contemporary furniture, vintage art and books. Pamper yourself with all the modern amenities and enjoy free Wi-Fi and free Netflix. We were made welcome from the very beginning. BC couldn’t do enough for us, very friendly and helpful. We had a late checkout which made our day so much better. Lots of coffee and teas and even chocolates. Highly recommend. Thank you for the nice review. We strive to create a great experience for our guests. Fantastic location, charming, clean, and a real home away from home feel! Thanks for the nice review. We try hard to make our guests as comfortable as possible. We love the Rondout! Perfect location, clean, and charming! This was a short girls getaway and it was perfect! I dont often leave reviews, but the owners went above and beyond. Everything was clean, thoughout, labeled and accounted for. Thank you! We enjoyed Brunette for drinks, Dolce for Brunch and Ship to Shore for dinner. This place was a great getaway from your busy life. The apartment was a home away from home. I would definitely stay here again! All the restaurants around the area are great. Two of them were my favorites: Ol Savnnah and Brunette. Perfect in every way ! Easy to get to , once parking was figured out not a problem.. wonderful restaurants near by for breakfast , lunch and dinner ! Apartment had everything you could need or want .. simply lovely .. Walk around see it all . Definitely take the drive out to Opus 40 ! Amazing .. The suite was wonderful - it was great to have all of the amenities, including a larger sitting area, kitchen and access to the warehouse district of Rondout. It was plenty close to Bard, which was my main destination. FDR's library and museum was a great day trip - about 30-40 minute drive from the inn. The guided tour and library self tour took about half a day, but could have taken longer for museum aficionados. I recommend it highly. Loved my stay, wish I had stayed longer. The notebooks of restaurant and local attractions were extremely helpful. So much to do and see....will return. Thanks to BC and Larry! Welcoming hosts BC and Larry. Amenities were outstanding. Everything you need. Excellent info about attractions and restaurants in binders.Roomy and comfortable. Don't miss Stockade District and French restaurant "Le Canard Enchaine". Bring binoculars to Hudson River cruise!. Great location and great support from owners. The bed was super comfortable and the motion detector night lights were helpful during the night. Excellent hospitality! R&F Paints still provide bagels and coffee in the morning and lunch for all staff and participants. Fabulous place to stay. Centrally located. Walk to the lighthouse ! Make sure you also go uptown ! Everything was great - location, the set up of the apt (especially having two beds w/ a door, great food waiting for us) great dinner recommendations - thoughtful note about goings on this weekend. Art galleries were fun to walk through, make sure to see Stockade section too! We appreciate the kind review. We continually strive to improve upon our guests' experience. Larry and BC were awesome as usual. We are repeat customers. It felt like BC and Larry had spent many nights there because they thought of every single thing a guest might want or need. Larry and BC are wonderful hosts. We loved the apartment-- great location, within short walking distance to shops and restaurants, clean, comfy bed, well equipped kitchen, even sherry for a nightcap-- everything was just great! Thank You for the kind review. BC and I try hard to make our guests feel comfortable and at home when staying at our inn. Everything was good, especially the roominess and location of the inn. The foldout bed was a bit too firm for one of us. the other can sleep on anything. The owners/innkeepers were extremely helpful, informative and kind. The best area to stay with restaurants shops and the river very close by. Rondout is a unique and lovely inn that is a pleasant surprise upon entering. 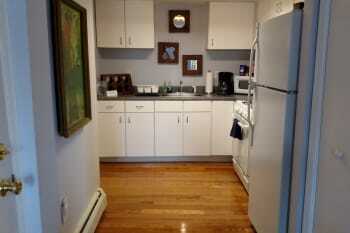 Perfect location in a quaint little town in the Hudson River Valley. Make sure you have a car to take advantage of everything the Hudson River Valley has to offer. We are so glad you enjoyed being in Kingston's historic waterfront. We try to make our guests experience with us as comfortable and enjoyable as possible. We strive to make your stay as comfortable and enjoyable as possible. We are proud to provide immaculate and uniquely designed apartment suites for our guests to enjoy. Had a great stay - thanks so much for the restaurant recommendations and the heads-up on the gallery crawl! We particularly loved Ship to Shore. We found the Esopus room to be just what we needed - well appointed, clean, and thoughtfully decorated! We had a wonderful weekend - thanks again! One *very minor* issue - one of the key rings became detached and very nearly locked ourselves out of the room, but fortunately noticed as it came apart and were able to track down the keys. May want to secure the latch/replace the ring. 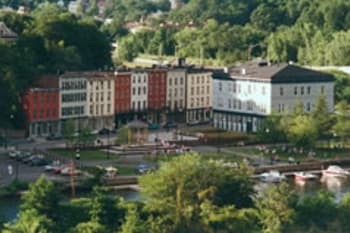 A very unique place to stay, in the heart of the Rondout. Larry and BC are delightful to deal with and make every effort to accommodate your needs. The room is well appointed with dishes and bathroom accouterments...and a welcoming bottle of sherry. Thank you for the kind review. BC and I try to provide a unique, comfortable, and fun experience. So glad you enjoyed yourselves. Perfect Location - Waterfront property near restaurants, museums, walking paths, and beautiful scenery. Very good eclectic retail nearby as well. Thank you for the nice review. We try to make our inn a unique and special place to stay. We very much enjoyed our stay at The Rondout Inn. Larry and BC could not be more kind and helpful, and we were so pleasantly surprised by the size of the apartment we had. We didn't expect to have a full place including a kitchen to ourselves for a few days. The apartment was very clean and fully equipped. We particularly enjoyed lounging around watching digital TV after a long day of exploring the area. The waterfront area in Kingston is beautiful. We enjoyed the nearby restaurants - Ship to Shore was our favorite - and the small boutique shops. The wine store just a block down was wonderful and the homewares store downstairs from the Inn was great as well. We went home with some knick knacks from there. Uptown Kingston, which is a 10 minute drive, was also very enjoyable. We loved Stockade, where we spent New Years Eve, and Kovo had some of the best Greek food we've ever tasted. Nice owners friendly and helpful. Accomdations were fun and unusual. Unique setting. Great restaurants all over town. A foodies delight!!! The owner charming and accommodating. We were in the Libris Studio for our long weekend stay. Excellent accommodations. Located a short walk from the waterfront. Our room was immaculate! The weather was chilly, but the room was snug, and warm. Bed was very comfortable. 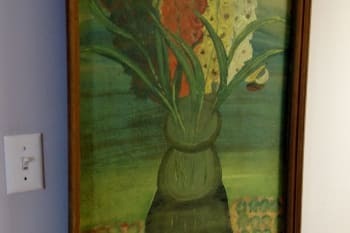 The room is furnished with interesting antiques and artwork on the walls. Large walk in shower in this modern bathroom. The Libris is an excellent value. Kingston is convienently located near many interesting towns and attractions. Good location to see area. We strive to provide a unique experience and make you feel like you are in your home away from home. Dolce was extremely good for breakfast. We also thought Mole Mole was very good for Mexican cuisine. The most unique place we ever stayed. Loved looking at all the antiques. 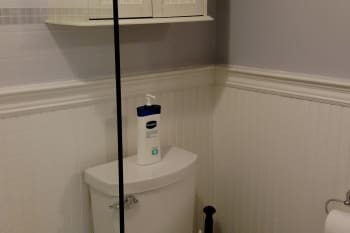 Bathroom was fabulous and had lots of towels and so many extras, like cotton balls, q-tips, first aid things... too many to list. We wished our stay was longer to take advantage of all the comfy chairs or watch tv, which we never had time for because there is so much to do in the area. Savano's was great! Diesing's Bakery is a must! Fabulous meal at Hoffman House. Could not possibly say enough about Rondout Inn. It's a beautiful, comfortable, absolutely spotless home away from home. From the very first contact, innkeepers BC and Larry have been gracious, warm, and accommodating. I was in Esopus suite and my friend in Libris. Perfect spaces both. Not a single detail is overlooked. 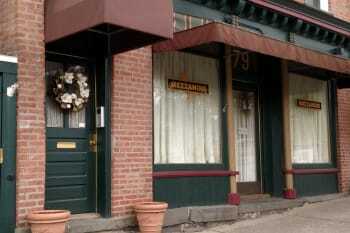 Take a trip to the Kingston, NY area just so you can stay at this inn. Take a walk down at the waterfront in the morning. Save some time for browsing the coffee/goods shop next door. We stayed in the loft at Roundout Inn for a weekend in the Fall. We were a group of 4 and it was the perfect space! Not only did Larry and BC so thoughtfully curate all the furniture in the loft, they also so thoughtfully welcomed us to their inn. Upon arrival, we got a very thorough tour of the place from Larry, who spoke to us about everything from the background of the artwork in the loft to where to eat in the neighborhood. We had expressed interest in visiting the galleries in the area and BC so kindly dropped by the next day with a map to the Art Walk in town. Everything in the loft was set up and ready to go. Over our weekend there, we did everything from cooking dinner to watching Netflix to ready mystery books from off their shelf. It was the perfect home away from home and our experience there was very special. The farmers market in front the Old Dutch Church was amazing! The galleries in town are great. Opus 40 was very impressive. My husband and I travelled from New Zealand and were on a road trip along the Hudson River. 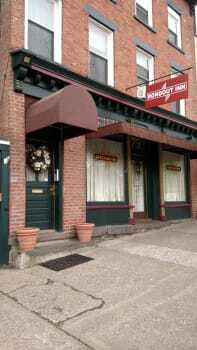 We stayed a couple of nights at the Rondout Inn. Having come so far we were not disappointed by a thing. The room was beautiful and roomy. There was everything we required plus more. Coffee making facilities to get the day started then just minutes from many restaurants. 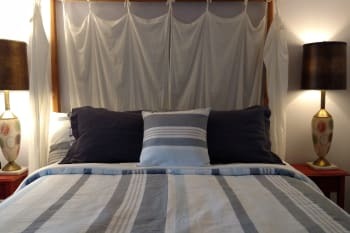 The bed was fabulously comfortable with quality linens. BC and Larry were very quick to return emails and we're extremely helpful.We highly recommend this accommodation....just wished we could have stayed longer. We appreciate the kind review. We work very hard to make our guests feel that they are at their home away from home. The only reason I would not recommend it is so I can keep it my secret...but that would be selfish. Ok it is the best place I have ever stayed so there! Awesome place! Hosts were super friendly and offered lots of advice on activities and places to eat. The room was very cozy and we slept very comfortably in the bed. Netflix on the giant tv was a nice bonus! Parking is on the street, but free and plentiful. This was the most fantastic, exquisite space I have every stayed in. Wonderful open feeling. Gorgeous furnishings and artwork. It was like staying in a museum except that it felt very comfortable and private. First good nights sleep I have had in a long time! The location is also superb. Walking distance to everything you would ever need. Great restaurants and shops and coffee. loved the antique store on the corner. Also the little privately owned shops with unique items. I finally was able to buy some different gifts for my friends. Thank you for the review. We work hard to keep our property beautiful, clean, and comfortable. The best time to stay is every third Friday of the month, there is a lot to do in Kingston during the night market. I loved everything about our stay! No complaints at all!!!! The only thing I would mention in your advertisements is that there are several stairs to get to the room. It wasn't a problem for us but it might be nice to mention if someone has problems walking. We are very happy that you were pleased with our apartment suite. 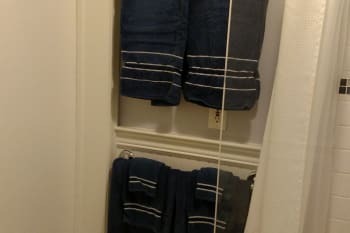 We strive to maintain very clean and uniquely decorated apartments. Three of our units are located in a 1820's renovated 3 story building. We have 1 unit that is 1 flight up and another that is 2 flights up and 1 unit ground level. The proprietors are very kind and accommodating. We were sidetracked at a stop to Soons Orchard Tasting Room on our way up, and were a little late upon arrival. BC was very understanding, and made us feel very welcome when we finally got up to Kingston. 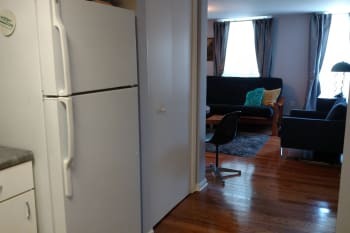 The flat is very comfortable, and has a good working kitchen. There was a lovely surprise awaiting us on the bed pillow, which immediately made us welcomed and at home. The location is perfect for walking about town and along the docks, and parking across the street is more than adequate. Kingston is a very nice spot to visit the Hudson Valley. We went up to Albany to visit the Institute of History and Art one night, and then to Hyde Park and the Roosevelt Home another. The Farmers Market in Kingston is a real treasure, and very close, although not walking distance. We had a most excellent stay at the Rondout Inn. We are about 3 hours south of Kingston, so we took advantage of the proximity to Albany to visit. It is a straight shot up the interstate, and well worth a visit. The Maritime Museum in Kingston is very interesting, and you should most definitely trek over to Hyde Park to see the Roosevelt Home. We had a lovely picnic with goodies we found in the Kingston Farmers Market. Armadillos is a great little joint, with excellent food and drinks. Merle will welcome you in, and make it difficult to leave. Ship to Shore is a real treasure. Service and food is excellent. Highly recommend a dinner there, especially if you can get a window seat. The rooms were super clean with a nice blend of modern and antique pieces. We had all the modern amenities many of which were newly installed. His wife BC had organized everything for guests including very detailed informational binders about Kingston and the surrounding towns. Thank you for your kind review. We work very hard to maintain clean and comfortable suites. 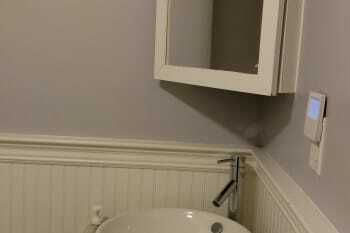 We also love to update and redecorate regularly. Everything that you may possibly need was available ... And then some! Greatly appreciated the evening cordial!!! The libra studio felt luxurious and cozy all at once. Larry and Bee, so cordial and friendly! I have highly recommended the rondount inn to all my friends! Enchanted bakery is a must visit! Comfortable, squeaky clean, and very helpful, welcoming hosts. The neighborhood is fantastic! Well done, everything was perfect. 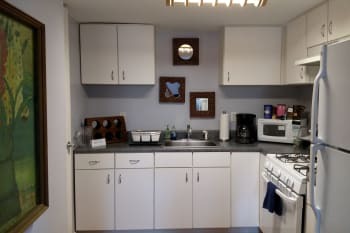 So clean, facilites and location excellent, bed was amazingly comfy! BC and Larry were so helpful and always stopped for a friendly chat if we bumped into them when out and about. Thank you for the wine and sherry!